Put simply, how much are you willing to spend to buy a customer? It’s not difficult to calculate, but it does take a few steps, so bear with me! First work how much the average customer spends in total – this is the customer lifetime value. Then subtract what it costs you in time and materials to provide your product or service. What you are left with is your gross profit. You need to subtract an amount to cover your fixed costs – rent, heating, telephones etc and then decide how much of the rest you are willing to spend to acquire the customer. Typically, this works out at around 15% of the lifetime value so this may be a good starting point if things are getting too complicated. Now you have your target acquisition cost you can make more informed choices about your advertising options. By taking the cost of the advert/fair etc and dividing by your target acquisition cost you know how many sales you will need to achieve and can work out whether this is realistic or not. “Can I ask how you heard about us?” is one of the most powerful questions you can ask. Make sure you ask every customer how they found out about you – and record the results. Its easy to create a simple spreadsheet with the customer, how they heard about you and how much they spent. You can then track how each of your advertising activities is performing – you may be amazed at the results. It’s important to record the value of each customer so you can make informed decisions about which activity to continue. An advert in a particular publication might bring in lots of enquiries but only a few low spending customers – while you might not meet many brides at your local wedding fair but if those you do see place large value orders it may be very profitable. Your business plan should include a section on marketing – how you plan to reach your prospective customers – and this should include the expected costs. I like to leave a small amount unallocated for last minute or too good to miss opportunities. Ideally you should allocate time every week to spend on activities which develop and promote your business. If you wait until you have some spare time you may find yourself in a classic “feast and famine” situation where you are snowed under for a period followed by a spell of struggling to find work. By setting aside, say half a day a week, for marketing – updating your website, preparing for a wedding fair, networking and so on – you will be continuously developing and building your business. 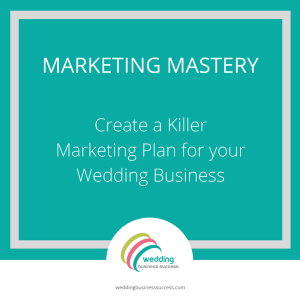 Of course, wedding businesses tend to be seasonal so you can aim to spend more time in the off-peak periods reviewing your marketing and gearing up for next year. But if you don’t keep things ticking over all year round you can exaggerate the seasonal effect and end up with a stagnant business and cashflow problems.